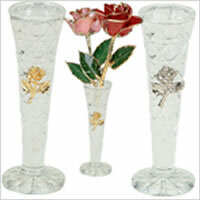 Personalize our traditional Gold Trimmed Rose in your choice of colors. 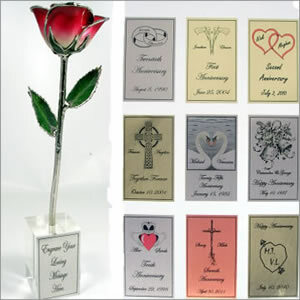 Share your love or Commemorate an important date by adding your short message to a rose petal. We start with a real rose and preserve it with enamel so that the colors and natural nuances of the rose can still be seen. Then we trim the rose petal edges and stem in 24 karat gold to create a lasting gift. To top your rose gift off add a birthstone to a rose petal. Select an optional vase. Added "Will you be my Forever" to the petal and charm to stem. Gave it 5 Stars! What a refreshing experience to work with such wonderful professionals. The product was perfect again and the experience sets a precedent moving forward. Thank you so much. Arrived promptly and safely. Customer Service was very helpful with getting the order just the way we wanted and when we wanted. Great experience. Thank you! beautiful - gold custom printing on petals exactly as I wanted. Base is perfect and sturdy.